Jeanette Tamez, presenter for the University of Texas Rio Grande Valley, speaks to students about the admissions process into college during "Take a Leap to Collage Day" at Nikki Rowe High School on Wednesday, Oct. 10, 2018, in McAllen. McALLEN — Nearly 1,500 high school seniors from throughout the local school district spent Wednesday morning learning various aspects for their transition to college, from personal finances to guidance to the numerous degrees available in the region. The McAllen school district held the district-wide event on Wednesday for seniors as the rest of their classmates took the Pre-SAT testing. The district invited speakers from local banks to lead presentations about managing credit, as well as representatives from area colleges and universities who went over college application requirements and degree pathways available to students. 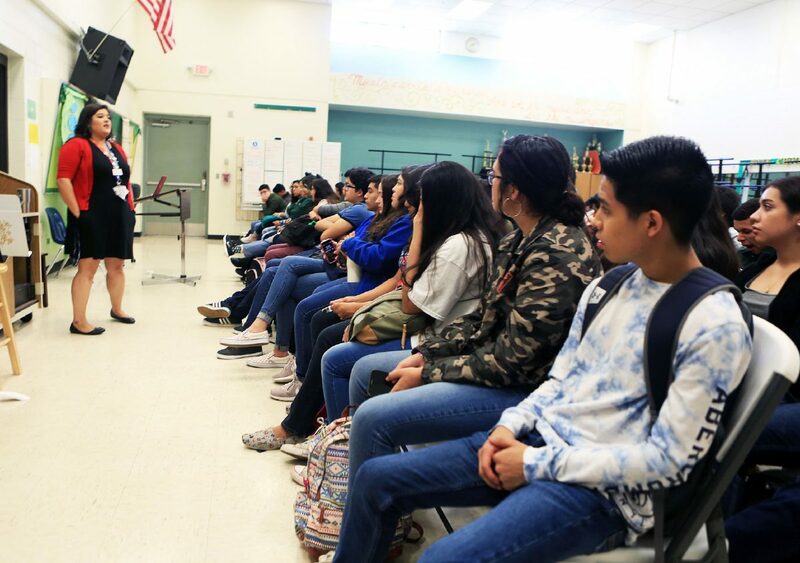 “Our data shows an increase in the percentages of students who have submitted an application to at least one university and also the percentage of students completing their financial aid application,” said Rosalba De Hoyos, school district director for college, career and counseling. Two years ago the timeline to begin applying for financial aid moved back from the beginning of the year, Jan.1, to early fall semester, on Oct. 1, allowing students to get started in the process earlier. This also prompted school districts to shift their college readiness initiatives to earlier in the school. At McAllen ISD, the district set up a December internal deadline to have 100 percent of students intending to go to college with at least one completed admission application, and at least 60 percent of students completing financial aid applications. And ever since this push to start the process earlier began, De Hoyos said they have noticed the number of student applicants increasing. Now, even with these deadlines in mind, De Hoyos said that each campus is held to their own capabilities and encouraged to not wait for the deadline but to focus on getting each student well underway and throughout the first part of the fall semester. The district started the school year with a College Night as an informational resource for parents and students to learn about scholarships, financial aid and college admissions. Also starting this month the district is holding weekly sessions in which parents and students can set up appointments at the College Center to get help completing their financial aid applications. The centers are available at every high school, De Hoyos said, and their goal is to get the applications done ahead of the college admissions deadlines, which for some institutions are as early as Nov. 1. A financial aid information session open for families district-wide is scheduled Oct. 25 at McAllen High School from 6 to 7 p.m. This will be followed by a community-wide event called Transmittal Night held at South Texas College in which parents and students will receive help filing their financial aid applications from 5:30 to 8 p.m. Oct. 30. These events, and most of the district-wide push to increase applications, would not be possible without the availability of the College Centers and the help from organizations such as AmeriCorps, an organization that places college student volunteers in area high schools to aid students in the college application process, De Hoyos said.